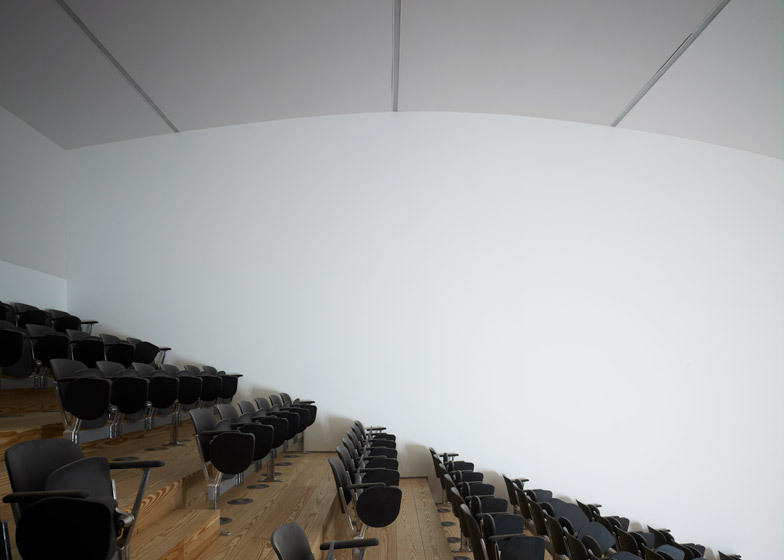 Shiny metal cladding and exposed ducting lend an industrial feel to this auditorium for a virtual-reality research centre in Portalegre, Portugal, by Eduardo Souto de Moura and Graça Correia (+ slideshow). 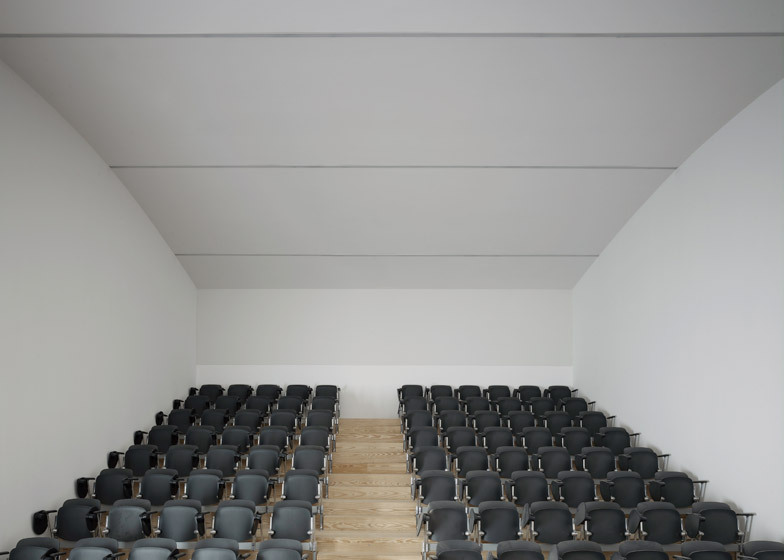 The auditorium is part of a masterplan developed by Souto de Moura – the 2011 Pritzker laureate, responsible for buildings including the Paula Rêgo Museum in Cascais – and regular collaborator Graça Correia. The pair is gradually transforming a former industrial estate – once home to the Robinson Cork Factory, which has relocated to the outskirts of the city – into an arts and education campus, including a recently completed hotel management and tourism school and a new car park. 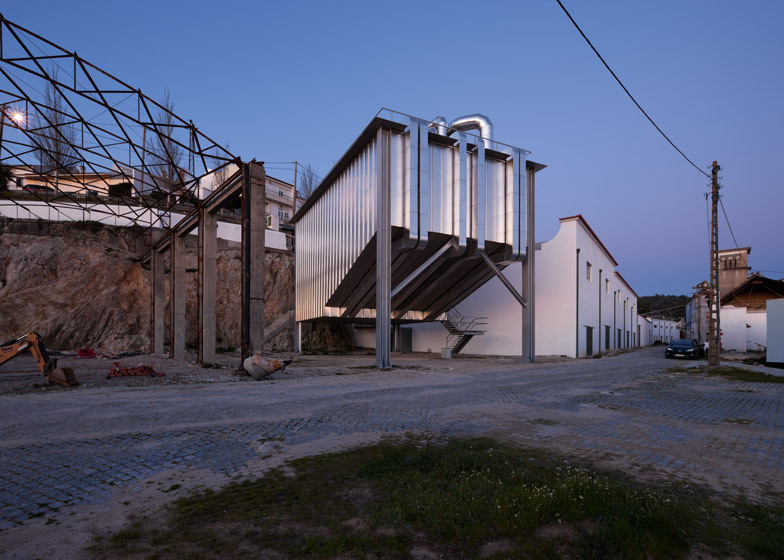 "The transfer of the factory to a new industrial area on the outskirts freed a 60,000-square-metre lot in a central area of Portalegre, comprising an important industrial heritage of hangars, warehouses and offices," explained a statement from the architects. "Inspired by examples of recovery in industrial memory as the Pompeia factory in Sao Paulo by Lina Bo Bardi, the enclosure management plan by Souto de Moura and Graça Correia proposes the creation of a 'city tour' formed by the combination of new and old buildings." The auditorium is part of a string of buildings on the site that are being converted and added to, creating a home for the International Centre for Technology in Virtual Reality (ICT-VR). The overall objective of the ICT-VR is to promote the development and use of virtual-reality technologies through teaching, and providing access to dedicated hardware and software. The Auditório Audiovisual is located at the end of a row of old warehouse and factory buildings that the architects converted to accommodate the centre's main amenities, including classrooms and a music auditorium. The new building is designed specifically for audiovisual presentations but can also be used for lectures and conferences. The transformation of the buildings into the ICT-VR focused on retaining their industrial character, and the audiovisual auditorium continues this direction with its function-led form and use of basic materials. The building's technical services are arranged on the roof. 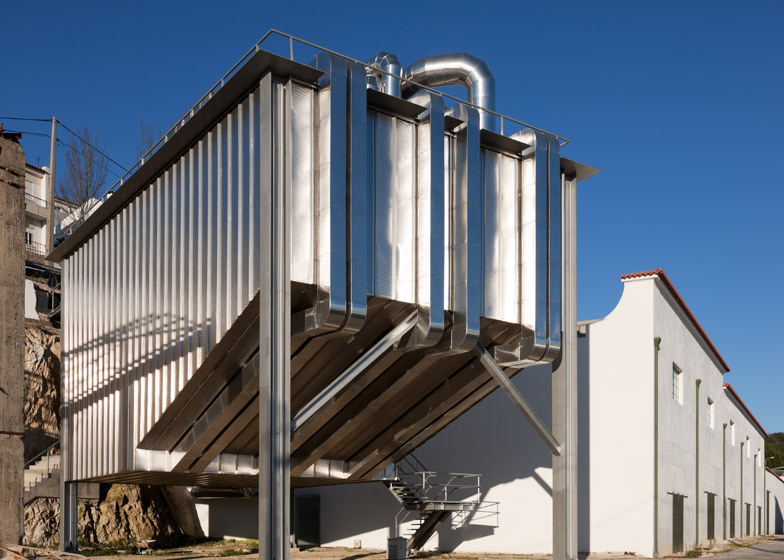 Ducting for heating and ventilation that extends down one side of the building creates a feature that references the dust-collecting machinery found around the site. 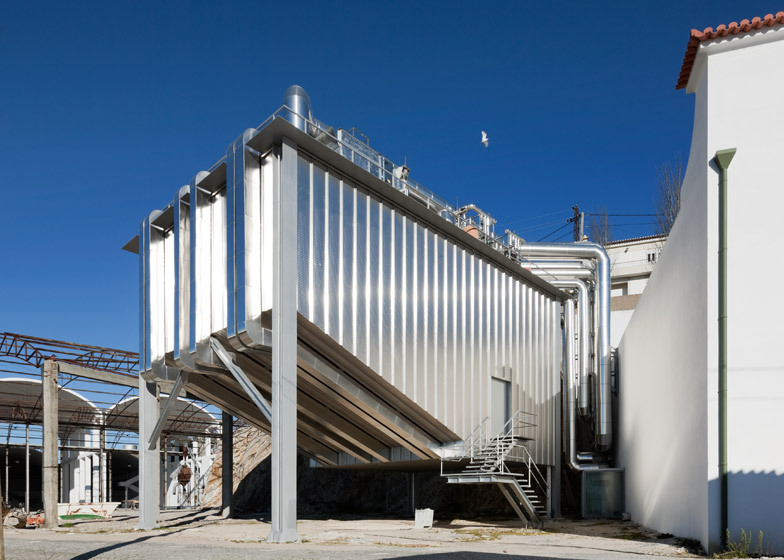 These collectors are often added to the outside of factory buildings that deal with the processing of materials like cork to filter particles of waste material from the air through the building's ductwork. They generally feature extraction pipes and a large hopper supported on stilts. "This building was thought [out] with a building system and image that refers to the configuration of the various 'metal machines' – authentic sculptures that point the whole factory," said the architects. "Like these, the infrastructure and pipelines are apparent and are part of the composition of the elevations." 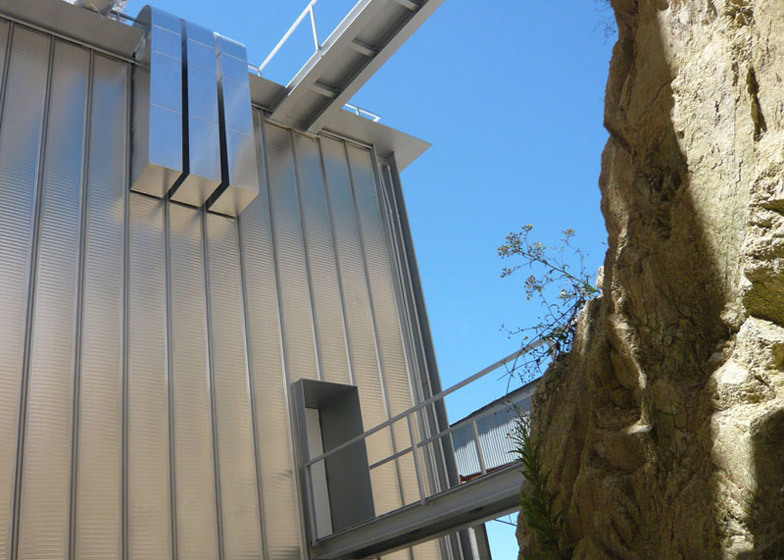 Like the dust collectors, the building is raised above the ground on metal pillars and features an entirely solid exterior clad in metal panels fixed together with standing seams. 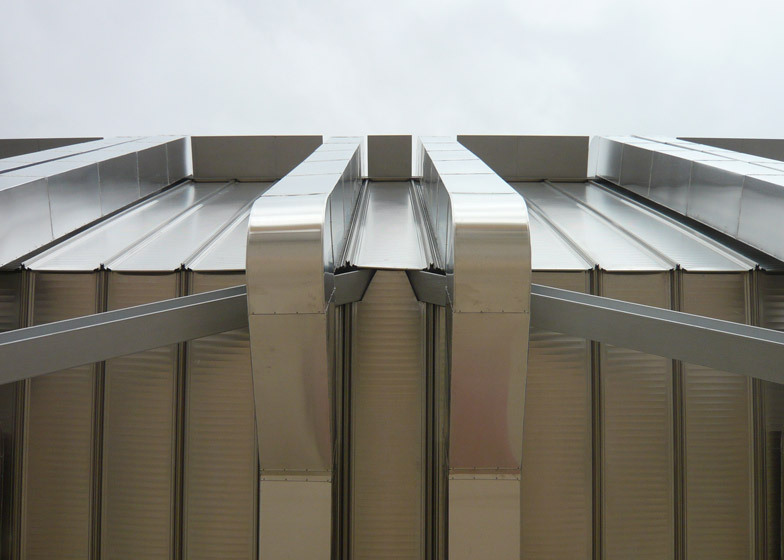 The underside of the auditorium slopes upwards to indicate the position of the banked seating inside and to create an open space below that limits its visual presence on the site. The entrance is accessed by ascending stairs at the side closest to the main campus building. An additional staircase to the rear, which is set into the rock of the adjacent hill, leads to a short metal bridge crossing the gap between the rocks and the door. Inside, the auditorium features a curved ceiling intended to improve acoustics within the space. Rows of flip-down chairs arranged along the banked solid wood steps are the only furnishings. 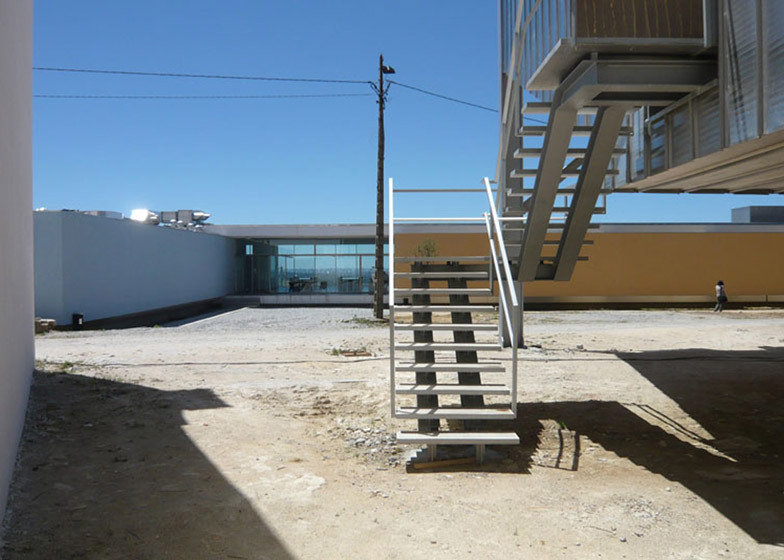 Elsewhere on the site, the architects converted a shed with vaulted roofs into a parking garage and events space, and added a new building to house the hotel and tourism school, which is located directly opposite the auditorium. Souto de Moura often collaborates with other architects, most notably with long-term friend and fellow Pritzker winner Álvaro Siza. 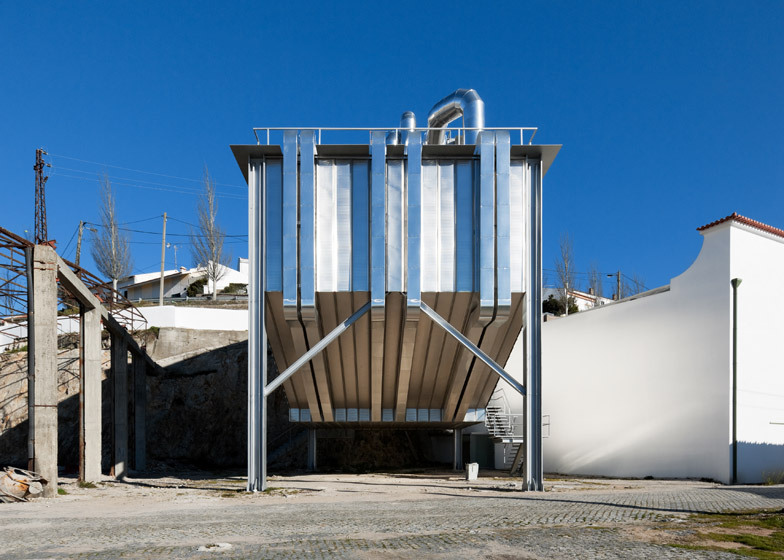 Other recent projects by the architect include a cultural centre in Viana do Castelo that resembles a giant machine. Photography is by Luís Ferreira Alves and Christian Richters.